Here in the foothills, tadpoles practise to be grown-up frogs in crystal-clear ponds, surrounded by wiry grasses and tough little plants that have spent the winter sleeping under the snow….These are the headwaters of the Murray River, where the story begins. From its small beginnings high in the Australian alps to its meeting with the sea, the Murray River’s beauty is legendary. But, though it is home to a vast range of wildlife, including fish, birds, frogs and insects, it has also played a major role in Australia’s farming, transport and industrial history and, as such, its delicate balance has been impacted. 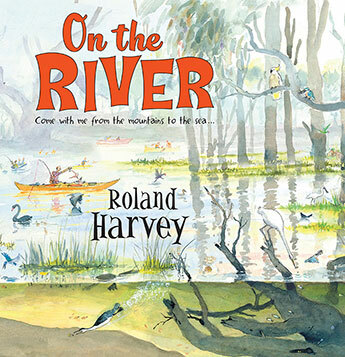 In On the River, author/illustrator Roland Harvey travels the length of the river in words and pictures, with his pelican friend, exploring the beauty of the river, as well as its history, its role in the lives of both the natural and human world, and its struggles. Populating beautifully rendered realistic landscapes and aerial views with the slightly cartoonish human figures which Harvey is known for, the book mixes whimsy with serious subject matter, highlighting the plight of the river as well as the things it is loved for, including recreation and its beauty. Useful for classroom purposes, On the River is also great for private enjoyment. Anders and his friends, Bernie and Eden are looking forward to their holidays, now that school is finished. Anders and his family are going away, as is Eden. But Bernie has no plans as his father has to work. Anders soon sorts that out and Bernie joins his family at the holiday camp. There they spend their time exploring, having fun, making new friends. Eden is happy to join in, but is just as happy to entertain herself with her own projects. Now Anders is not the only one with a beetle, there is even more adventure to be had. Their new friend doesn’t have a beetle, but she does have a cricket, a jumpy one. 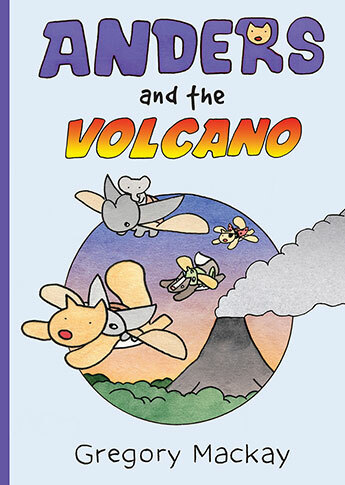 Cover art shows the friends flying with the aid of their beetles/cricket and the smoking volcano hints at their interaction with this extinct volcano. Characters are drawn lightly as animals of different species. Told in graphic novel/comic format, Anders and the Volcano is light on text, heavy on image and packaged as a novel. This second adventure with Anders and his friends (Book 1: Anders and the Comet) explores many familiar aspects of summer holidays – going away, exploring, playing, sleepovers. Each of the characters has their own story, and represent a range of family types and backgrounds. The style of the images is uncluttered and gentle and would be accessible to a wide range of readers and reading abilities. Younger competent readers will enjoy the adventures told in the comic style and older readers not ready for full novels will appreciate the different character journeys and the clarity of the text. Recommended for newly competent and mid-primary readers. Captain Cook was the greatest explorer that ever lived. Third Grade is going to be the best year of my life. It’s History Week and learning about Captain Cook is the second-best thing that has ever happened in Ms Fennel’s class. The first, of course, being the escape of Ambystoma mexicanum, which is Wikipedia for axolotl. 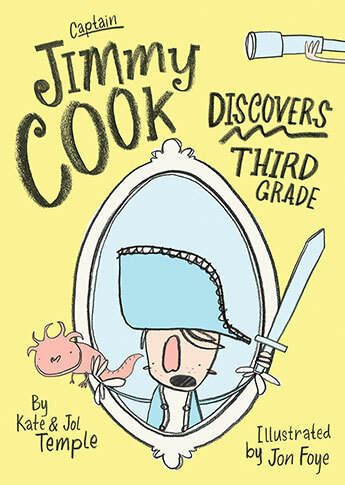 Jimmy Cook has just discovered a link to Captain James Cook and decided that these genes mean that he is destined for Big Things. He’s keeping a log – a Captain’s log – of all his plans and observations. One of his plans involves completing some of Captain Cook’s unfinished tasks. But first he has to overcome some obstacles, the most troublesome of which is fellow classmate and all-round pest Alice Toolie. No matter what he does, she seems to get there first. But Jimmy is undaunted. World class explorers have to expect a few setbacks. Illustrations scatter throughout to help Jimmy be sure that readers understand his world. If bright ideas and enthusiasm are what spins the world, then Jimmy Cook is sure of many whirlwind adventures. His Captain’s log overflows his brilliance and capabilities. Nothing shakes his confidence, nothing gets in his way. Not pesky classmates, not the doubts of others, not reality. He is ready to take on the world. Whether or not the world is quite ready for some of his wilder ideas, is another matter. Young readers will be carried along in the excitement of Jimmy’s missions and laugh out loud at some of the absurdities. Recommended for newly confident readers who still like a few illustrations to break up the text. And that is that girl. This girl and that girl are very different. They dress differently. Their houses are next door to each other but very different. Their families are different in how they look and how they live. But even though they are different in so many ways, this girl and her dad, and that girl and her dad both arrive at the same place. Illustrations are blackline and watercolour, loose and colourful. As the story unfolds, the girls, set in white space, gradually fill the pages with their personalities and adventures. 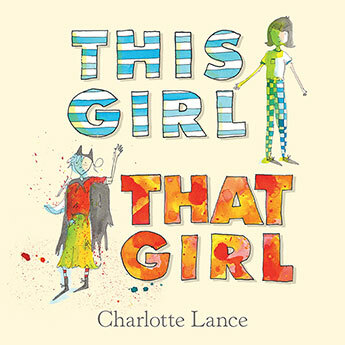 This Girl, That Girl is a funny and lovely story about travelling different paths to the same destination. It’s about being different within a family as well as to others outside the family. The girls are both fully engaged with their families and their worlds (even when they are at odds with the ‘family way’ of doing things), and both are happy with their own way of living and doing. At the end of the hard work, despite their differences, the outcomes are less different than might have been expected. Great material for classroom and home discussion. The text is spare but the story rich. Recommended for pre- and early-schoolers. Soon Subhi, the people out there will remember us. Soon they’ll see that living in here isn’t living at all. We just need to show them who we are, that we’re people, and then they’ll remember. This time, they won’t forget. Subhi was born in a refugee camp, and has never known freedom. His mother and sister remember life before, and the dangerous journey to get to Australia, but now even his mother has stopped hoping, stopped telling the stories of home, and teaching Subhi their language. Subhi still believes in goodness, and lives with the hope that one day his father will come and join them and that they will live outside of the camp. Jimmie lives close to the camp, with her father and brother, but since the death of her mother the family is barely functioning. Jimmie rarely goes to school because Dad works shifts and her brother is too busy to take her. She wonders about the nearby camp and whether its inhabitants have things she doesn’t. When she finds a way in, it is Subhi that she meets. The Bone Sparrow is a moving story of friendship and survival. Both children are scarred by what is happening in their own lives, but each is able to offer the other hope. Beautifully told, The Bone Sparrow will bring tears, and a desire to change things for kids like Subhi. The voice was like a frypan clanging on the head of Pollo di Nozi, Youth Reporter for the Coast newspaper. She leapt around to face its owner. She turned around to face its owner. ‘The first case you’ve had in weeks,’ said Will. Things have been mighty quiet in Riddle Gully. While this might be good news for the town, it’s not good news for intrepid reporter, Pollo and her slightly less enthusiastic, and often hungry sidekick, Will. But this trail, which leads them deep into the bush is sure to lead to super-scoops and further advance Pollo’s blooming career. And it does lead them to a mystery – with more leads than even Pollo could have imagined. Why don’t the campers want to be found? Who else is interested in the secrets of the hills? Pollo is desperate to find all the answers. All she has to do is convince Will to help her, untangle all the stories and fame will surely be hers. Riddle Gully Secrets is the third mystery in this series set in a small town, Riddle Gully. While everyone else goes about their business, intrepid reporter (junior) Pollo sees intrigue and mystery everywhere. Her offsider, Will, is supportive but sometimes overwhelmed by Pollo’s enthusiasms. And there are many. ‘Riddle Gully Secrets’ explores secrets, greed, history, family and belonging, wrapped up in a mystery full of fun and wide-ranging adventure. Recommended for mid-primary readers and lovers of mystery.